Sabriel has lived outside of the old Kingdom attending school and when her father goes missing she is drawn back into a world she is just not prepared for. What really lifts this book is Nix's imagination for he has created a stellar and some stellar characters. You really feel drawn into this world with magic being kept at bay by a wall, the threat of death coming over the wall and one young woman who has to risk everything. 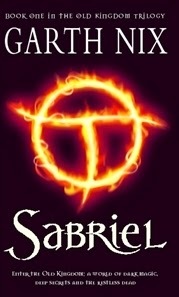 Sabriel as a character is a lovely mix of headstrong and weak. There are times when she truly doubts herself and her abilities, just like we all do. Yet she finds within herself and from those around her the strength to forge forward. Mogget is a wonderful creation, you are never sure whether to trust him or not and Touchstone, well you have to suspect his story has not been fully revealed. There is wonderful darkness about this novel with magic being used to meddle with death and it is a really clever twist. Do not be put off that this is a young adult novel, Nix has created a rich tapestry of characters and a world to really lose yourself in.